This is a really basic soup that could be changed in so many ways. You could add some pancetta while making the soup or as a garnish when serving, you could add some rice or small shaped pasta to the soup as it simmers, or you could ladle the soup over a slice of crusty grilled country bread rubbed with garlic. I’m trying to keep my lunches light and healthy this spring, so I simply served the soup with a sprinkling of fresh herbs on top. I found the beans really added texture and created a soup that was hearty enough to keep you satisfied on it’s own. The flavors in the soup actually improve as it sits, so it is a great soup the day before you plan to serve it and let it sit in the refrigerator overnight. Simply reheat before serving! Peppers are rich in carotenoids, a pigment that helps to boost immunity, and to fight cancer and heart disease. 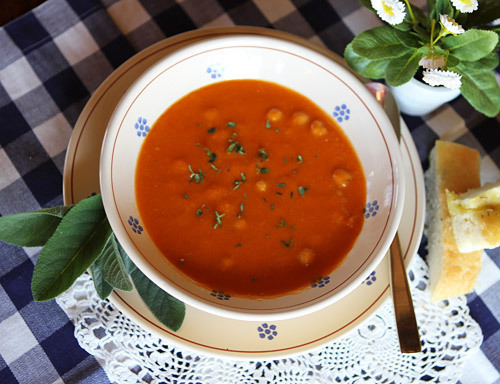 One small red pepper gives you up to three times your daily requirement of vitamin C.
Garbanzo beans rock as they are packed with fiber, protein, folate & hard-working phytonutrients. 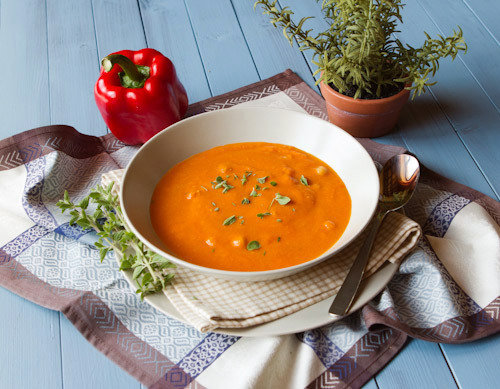 Roasting sweet peppers enhances their flavor bringing this soup to a whole new level.